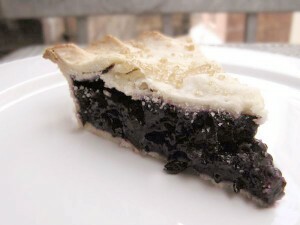 This is a great recipe for sweet pies or tarts. It makes enough for one 8″ double crust pie, two 8″ pies single crust pies, 6 4-5″ tarts or 12 2-3″ tartlets. Combine flour and sugar in the bowl of a food processor for a few seconds. Add butter and process until it resembles coarse meal – about 10 seconds. With the machine running, add the ice water through the feed tube in a slow, steady stream, then egg yolks, processing just until the dough holds together. Try not to process for more than 30 seconds. Turn dough out onto sheet of plastic wrap. Flatten and form into a disk. Wrap, and refrigerate at least 1 hour before using. This recipe can also be made with 1 cup white all purpose flour and 1 ½ cups whole wheat flour if you want a more hearty, healthy pastry. Based on my mother’s recipe.